Theladyandseitan.com: The home of stick-to-your-ribs Southern vegan cuisine. Welcome. Welcome. Welcome. Thank you for stumbling upon my little blog and checking it out. This is The Lady and Seitan Blog dedicated to my favorite silver fox, Paula Deen – well my second favorite silver fox, Anderson Cooper still holds a special place in my heart but he doesn’t cook for a living so I had to go with Paula. My goal every week is to dive head first into the world of Paula Deen from her popular cooking shows to her bestselling cookbooks all in the hopes of bringing you veganized, slimmed down versions of Paula’s creations complete with nutrition analysis of the original and veganized recipe. So put up your feet, take a look around and make yourself comfortable – it’s time to start cooking! My daughter is a bonafide carbs lover. Which means every week in my house I’m churning out a batch of some kind of bread, muffin or biscuit. With the end of summer I found myself making more zucchini bread than any family could ever eat alone. If a swarm of zucchini eating locust attacks all the zucchini crops in the U.S. and you are in need of a freezer full of zucchini bread just head down to Atlanta and we’ll take care of you. Needless to say, I’m tired of zucchini bread – even if my little one isn’t. 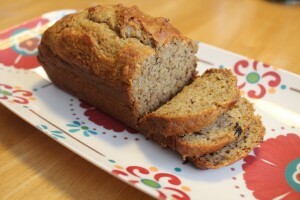 With two bananas going from ripe to seriously overripe on my counter over the course of the week I decided to turn my sites to a nice loaf of banana bread. Around these parts I’m what is known as the sugar police. I spend my days cutting the amount of sugar in anything that goes into my daughter. On any given day I can tell you, down to the grams, the amount of added sugar she’s had in a day (but then again I am a pediatric dietitian so what do you expect?!) Aside from the occasional green juice we are a juice free house, no syrup on our waffles, no pastries for dessert. Yep…it’s that kinda house. So when I ran across Paula Deen’s recipe for Orange Banana Bread I knew I would have to take things down a notch. Is it really considered bread anymore if it has 1 cup of sugar in it? Let’s call it what it really is, cake. And I’m not serving my sweet little one cake for breakfast. The only thing “orange” about the recipe was 1 tablespoon of orange zest so I just took that out completely and veganized it to my hearts content. The result is a super moist, sweet, mini-loaf of banana bread that relies on the sweetness of overripe bananas rather than tons of sugar. My little one can’t get enough of this bread so it looks like it is a winner! 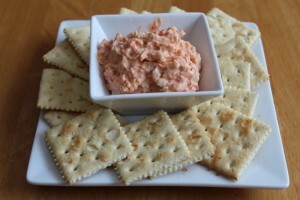 This recipe is just about as easy as they come. With just 3 ingredients and and a 5 minute prep time it’s perfect for a busy night when you have no time to cook but want a flavorful home Greenhouse cooked meal on the table. Paula’s original version called for 2 eggs but Match Meat Ground Pork is moist enough that it doesn’t need anything extra to help the breadcrumbs and french onion dip stick. If you don’t have Match Meat Ground Pork available then you can substitute my recipe for Southern Style Seitan in it’s place. The original recipe also calls for French Onion Soup mix which is much higher in sodium than the Simply Organics French Onion Dip. The results are a lean, protein packed, flavorful dish the whole family will love. Enjoy! Preheat oven to 400 degrees F. Line a baking sheet with a silpat, parchment paper or nonstick foil. 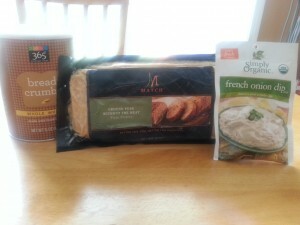 Combine bread crumbs and french onion dip mix. Divide Match Meat ground pork into four 1/4 inch thick cutlets. Press into bread crumb mixture and coat both sides. Arrange in a single layer on baking sheet and spray with cooking spray. Bake for 10 minutes, flip and bake for an additional 15 minutes. I’ve been growing my own food for about 2 years now and the process, for me, is still full of trial and error. To be honest, I really don’t know what I’m doing. I just put seeds in the ground, try to come up with a good mix of soil, water it (when I remember) and cross my fingers. 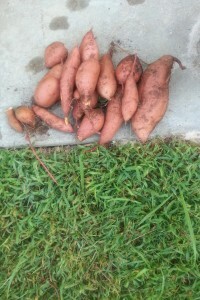 I planted sweet potatoes for the first time this year and was completely caught off guard when my two sweet potato plants began to completely take over my garden growing into the tomatoes, the green beans, suffocating my carrots and growing out of my raised bed and into my salad greens gardens and my lawn. With all this growth I saw no actual potatoes. I finally found one hidden under what seemed like 2 feet of foliage. I figured they were growing under ground but if they were what was with this ridiculous amount of leaf growth with nothing to show for it? Finally, a couple weeks ago I started to pull up my summer garden to make way for fall and I began to pull up my sweet potato plant. To my surprise there were sweet potatoes everywhere buried deep in my garden (I was still finding sweet potatoes a week later as I continued to till and turnover the soil). Giant, orange flesh potatoes just kept coming out of the garden. I was so excited! I got to work making sweet potato everything – biscuits, muffins, pancakes, waffles, baking the smaller “fingerling” sized ones up and eating them whole and, of course, sweet potato fries. Paula’s original version of this recipe calls for 1 tablespoon of salt which is nearly 1700mg of sodium per serving! Whoa! I can feel my blood pressure go up by just looking at the recipe. Leave it to Paula to take a perfectly healthy sweet potato fries recipe and find a way to make it disastrous for your health. To put things in perspective high risk populations shouldn’t consume more than 1,500mg of sodium a day and the general population shouldn’t consume more the 2,300mg a day. Well I reduced the salt down to almost nothing, just enough to bring out the natural flavor of the fries, and baked them up nice and crispy. When my daughter saw these coming out the oven she immediately exclaimed that it was dinner time and sat down at the table to eat so I didn’t get a chance to plate it up pretty for a picture. 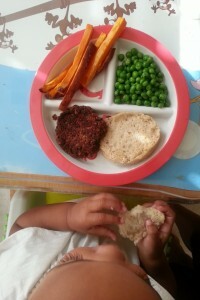 Instead, I I was able to get a quick shot of her dinner plate (with the potatoes, a black bean burger and peas) before she devoured it all. Line a baking sheet with a silpat or parchment paper. In a large bowl toss sweet potatoes with olive oil and sprinkle with house seasoning and paprika. Spread sweet potatoes in single layer on prepared baking sheet. Bake until sweet potatoes are tender and golden brown, turning occasionally, about 25-35 minutes. Beat cream cheese until smooth with an electric mixer then all remaining ingredients and beat until combined. 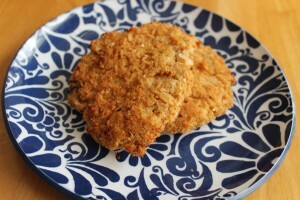 Of the 3 blogs that I write for The Lady and Seitan is the most labor intensive. Digging through a stack of Paula Deen books and magazines, picking the recipe, figuring out how to veganize it in the best possible way and then making sure I find a way to also reduce calories takes a lot of time. Then on top of that I have to run nutrition analysis for both the non-vegan and the vegan version, which can take up to a week. So, for the time being, I’m taking a hiatus from…wait! Don’t jump to conclusions, I’m not taking a hiatus from the blog but I am taking a hiatus from running the nutritional analysis on each recipe for the time being. I have so many great recipes that are just waiting to be posted but sit on my computer, unshared because I haven’t run the analysis on it. And frankly, I really just want to get the recipes out of my head and into your kitchens so for the time being that’s what you’re going to get, great veganized southern fried recipes with nutrition analysis added at a to be determined date. Happy Cooking! © Copyright 2016, The Lady & Seitan.